We’ll be visiting Africa for a while – I hope it will be enjoyable! This piece, in the Lingala language of the Congos, was recorded by Hugh Tracey (see the Kankalongo Alidor post for more background on Tracey). While I’m unsure exactly where in the region Tracey recorded this piece, or where Kamwema and his friends hailed from, we do know that Tracey recorded four songs and a couple of demos by the group ca. January of 1952 (some sources say 1950, but I am not yet convinced). While both sides of this disc are in Lingala, Kamwema also apparently sang songs in Luba and Swahili. Tracey knew and loved the acoustic guitar music played across Africa, and recorded a significant amount for Gallotone and Tracey’s sister label under Gallo’s wing, Trek. 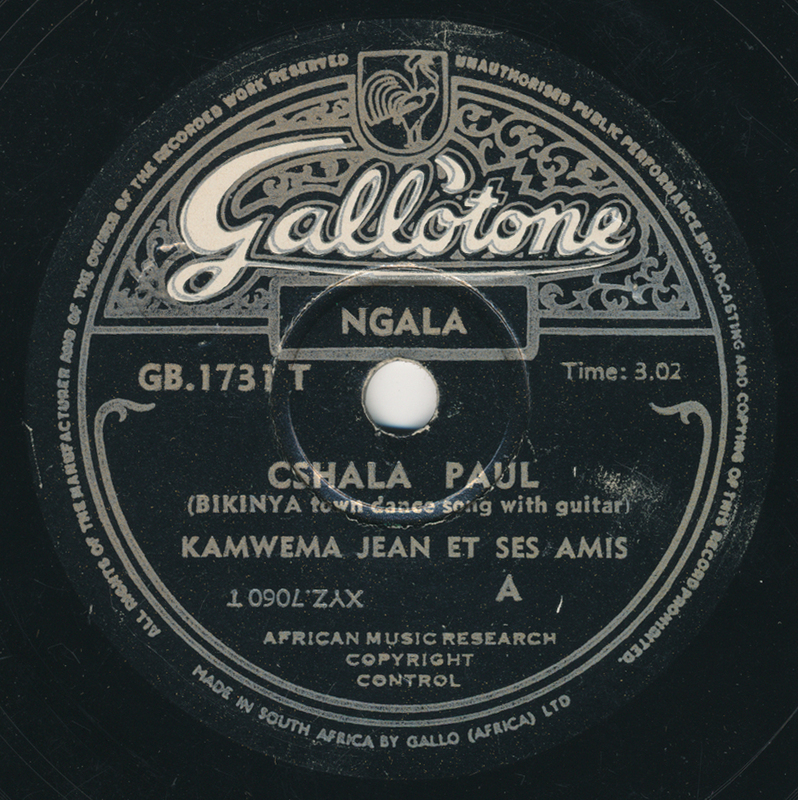 Fellow Congolese guitarist Jean Bosco Mwenda, for instance, recorded dozens of discs on Gallotone, as did the famous guitarist of Bulawayo, George Sibanda. The rate at which these discs turn up, however…well, that’s a familiar refrain. Enjoy, and welcome to 2011. I am aiming high! This is a great way to start the year! Thanks! hey jon – this is definitively THE way to tune up a happy new year – good luck!! just got your package and gave camille a warm welcomin’ – love it!! Ah – lovely. What a special treat for the New Year. Aiming high sounds good to me! Thank you gracenotes! And thank you Reto – that’s excellent! What airiness and immediacy, what vitality, can one say more without becoming verbose? Thanks Jon! I really enjoyed this recorded and look forward to other African acoustic guitar music. That stuff is great. Andrew Tracy (one of Hugh’s Son) just retired a few years ago from the International Studies of African music. He was an expert Mbira player himself, first learning as a child. I’ve only just discovered your fantastic blog after purchasing the Strings LP today and seeing it mentioned in the sleevenotes. It’s a great listen so far! For future releases might you consider providing buyers with a download link for mp3s? Much as I love my vinyl, I do so much of my listening on the iPod into work these days. Thanks very much for the kind words and support, JH. Not sure yet about downloads, but I am sure the people in charge will take it into consideration! Any thought to adding Excavated Shellac to iTunes as a podcast, with automatic downloads of new material?